In a food processor, combine the flour, sugar, salt and butter and process for about 5 seconds. Add the ice water and process just until dough starts to come together, about 10 seconds. Lay out a long piece of plastic wrap on a work surface and dump the dough on this. Gather the dough together and pat into a neat disk. Wrap the dough in the plastic and refrigerate while you prepare the apples. Peel, halve and core the apples and thinly slice them, 1/4 inch thick or less. Place apples in a bowl and toss with the lemon juice. In another small bowl, combine the sugar, corn starch and cinnamon and mix into the apples until evenly coated. Preheat the oven to 400°F. Roll out the pastry to a 13 inch circle between the two sheets of parchment paper. Remove the top piece of parchment and transfer pastry to a large rimmed baking sheet. Mound the chopped apples in the center of the pastry to within about 1 1/2 inches of the edge. Dot with the pieces of butter. Fold the pastry edge up and over the apples. Brush the pastry with egg white and sprinkle with sugar. Bake for about 1 hour, until the pastry is nicely browned. Transfer the pan to a rack and let the galette cool. Serve warm or at room temperature with caramel sauce and vanilla ice cream. Have all ingredients measured and ready to go. Melt the sugar in a heavy sauce pan over medium high heat, stirring with a wooden spoon or whisk. Be very careful as melted sugar is extremely hot. When sugar starts to boil, add the butter and whisk until smooth. Remove from heat and whisk in cream and vanilla. Let cool a few minutes, then transfer to a glass jar. 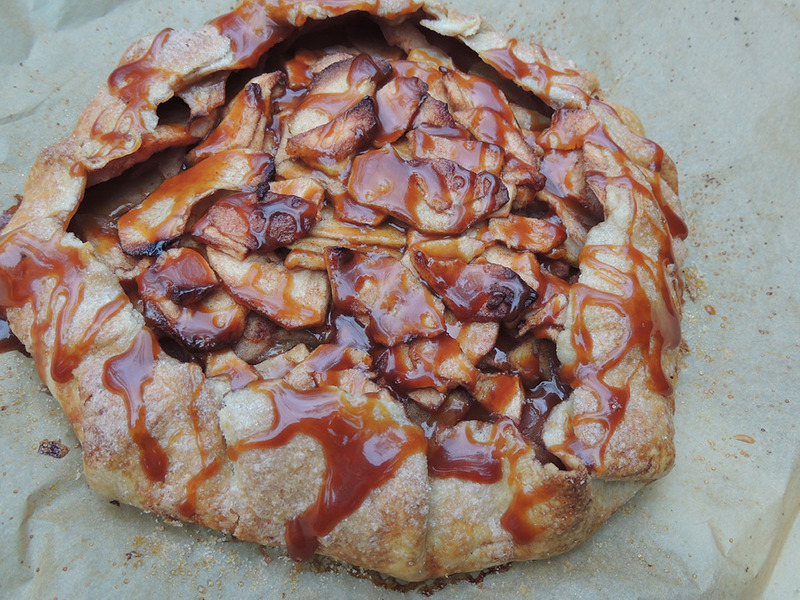 Let cool completely and drizzle over the galette. Store extra sauce in refrigerator.